How do you update a nearly 100-year-old beauty pageant for the #MeToo era? Give all of the brand touch points a massive makeover, including the organization’s online presence at MissAmerica.org. Carried out a content audit of owned properties to build a comprehensive view of the existing ecosystem in order to understand audience expectations. Conducted stakeholder interviews to give us insight into the frustrations and aspirations of our clients. 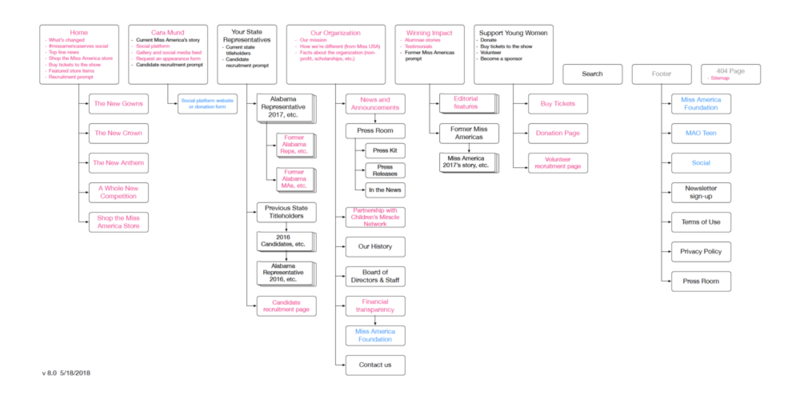 Built a site map to outline a new structure for the website, and to help us align with the clients on a content strategy that would meet their objectives. Created wireframes with an interactive prototype to test the new architecture, and make sure that the website would meet the functional and communication needs of the project. Integrated the creative design through theme development and custom CSS code to bring the website’s new personality to life. This was a pro bono effort, which by its nature required extra investment from the team. This meant that I was called on—and volunteered—for many tasks outside of my typical job description, including front-end web development, data entry, image editing, animation, social media production, and video editing. I animated he cinemagraph on the home page marquee (and as one of my more exciting accomplishments, it was shown in Times Square). A social announcement I animated also became a trending topic, and was covered by news media across the country. It was fun to have a hand in shaping the conversation through these assets, but more importantly, I became passionate about the mission. I found the work personally meaningful, because it was both culturally relevant and inherently a social good campaign. Our challenge was not a simple one; we had to change very deep-rooted misperceptions about what Miss America is, and help people realize that as a non-profit, the Miss America organization is the largest provider of scholarships to young women in the country. Its mission is women’s empowerment, and in the era of #MeToo and the (hopefully) last gasps of sexism in the modern age, our efforts couldn’t have been more timely, or felt more full of purpose. This campaign was one of the few projects among many produced within our network that VMLY&R selected to submit to the 2019 Cannes Lions International Festival of Creativity. We will find out in June if it is not just a creatively fulfilling project, but an award-winning one as well.